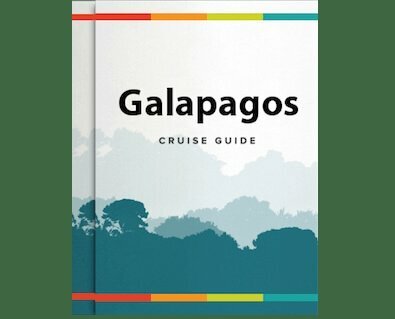 This cruise offers the south-central islands which are known for hosting a number of endemic species in the Galapagos Islands. Have the chance to spot thousands of gorgeous Waved Albatrosses at the Gardner Bay nesting site. Also, go snorkeling underwater below the towering Leon Dormido rock formation. 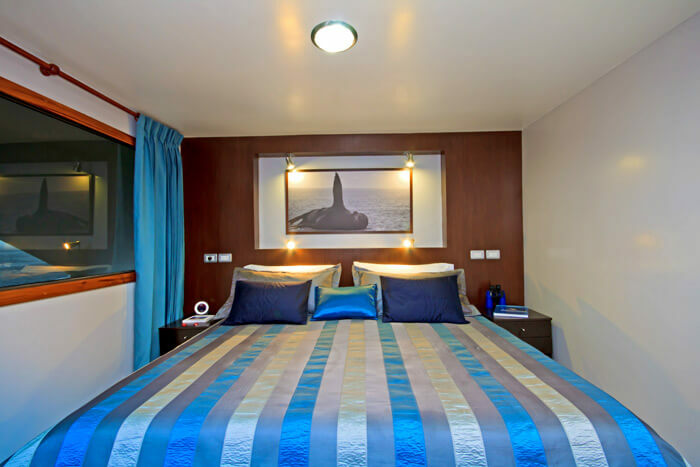 Extensive wildlife interaction is the main draw to this cruise. Santa Fe (Barrington) is home to the small picturesque bay and anchorage on the island’s northeast coast. The bay has two visitor trails, one leading to a scenic viewpoint atop a cliff, and the other spanning from a small beach to a tall prickly pear cactus forest. Highlights include Land Iguanas and giant tunas. This area is great for spotting Blue-footed Boobies, albatrosses and Nazca Boobies. A beautiful site on the ocean front, the large Waved Albatrosses use the cliff as a launching pad. The famous attraction is the magnificent blowhole, spurting water high into the air. This site presents wonderful photograph opportunities. Highlights include Hood Mockingbird, Nazca Boobies, Waved Albatross, Red-billed tropicbirds, lava lizards, Galapagos Hawk, blue-footed boobies, blow hole, and amazing landscapes. Gardner Bay, on the eastern side of the island, is the breeding site of nearly all of the world´s 12,000 pairs of Waved Albatrosses. It has an ample white sandy beach with a myriad of sea lions, perfect for relaxing. Its rocky shores make this site a great place for diving and snorkeling. Highlights include white sandy beach, sea lions, mockingbirds; snorkeling: colorful fish, and a sea lion nursery. After landing, you can walk across a lovely white sand beach amongst a busy sea lion colony or dive into the water to swim with sea lion pups. This small island is a marine visit where you can enjoy fantastic snorkeling and swimming. Highlights include a white sandy beach, sea lions, and mockingbirds. The Interpretation Center was opened in 1998 as a phase of the project “Interpretation and Environment Education Project.” Visitors enjoy expositions on natural history, human history, and conservation. The conservation efforts represent the movement to protect the wildlife and natural environment through means of population and tourist control. The Interpretation Center has an outdoor stadium, audio-visual equipment, and meeting rooms. Highlights include various interactive exhibits for all ages. A visitor site in the southeast part of San Cristobal Island that can be reached in roughly one hour by road from Puerto Baquerizo Moreno. On the trees and shrubs surrounding the site, you may see land birds like warbler, finches and mockingbirds, and on the trails, giant tortoises. Highlights include giant tortoises in captivity and land birds. Isla Lobos or Lobos Island is named after the sea lions that rest and play on its rocky shores. It is also home to blue-footed boobies, great frigate-birds, brown pelicans, lava gulls, common noddies, yellow warblers and small and medium ground finches. There is good snorkeling in the clear waters of the channel and this is one of the best sites at which to swim with sea lions underwater. Highlights include Snorkeling with sea lions, frigatebirds, and Blue-footed boobies. This striking rock formation is located a couple hours off the western shore of San Cristobal. Jutting out of the water, the rocks stand vertically at hundreds of feet above the ocean divided by a small channel. Although there are no landing areas, kayaking and scuba diving allow visitors to spot a variety of marine life. Highlights include great snorkeling: sharks, tropical fish, turtles, manta rays (occ. ), hammerhead sharks, spectacular rock formations; sea birds: blue-footed Boobies, Nazca boobies, and frigatebirds. Pitt Point, situated on the north-eastern tip of the island, hosts frigatebirds, storm petrels, and all three types of Booby Birds: the Nazca, Blue-footed and Red-footed Boobies. A steep trail goes up a cliff and through a ravine leading visitors to an area with an abundance of birds. This site is also great for snorkeling and scuba diving. Highlights include wonderful landscape, sea lion colony, and 3 possible species of boobies. Located on the northern coast, this eroded hill and its surroundings present one of the most picturesque beaches in the Galapagos with its white powdery sand and the abundance of animals. Wildlife includes sea turtles, rays, and various types of booby birds. The clear water provides an excellent opportunity to enjoy swimming and snorkeling. Highlights include beautiful rock formations, sea lions, shore birds, finches and mockingbirds; snorkeling: nice tropical fish, anemones, and sponge coral. In the 18th century whalers passing through the islands placed a wooden barrel on Floreana Island for use as an unofficial mail box. The tradition continues today as visitors leave addressed postcards in the barrel and sort through left mail to deliver at home. Highlights include a nice sandy beach. This site hosts a large flamingo lagoon where other birds such as common stilts, White-cheeked Pintails can also be seen. The beaches on this island are distinct: The “Green Beach” named so due to its green color, which comes from a high percentage of olivine crystals in the sand, and the “Four Sand Beach” composed of white coral. Highlights include flamingoes and a green-colored beach. One of the best snorkeling sites in the Galapagos, this volcanic crater has been eroded by the waves leaving the northern and southern sides poking out of the water. The coral reef in the middle is perfect for attracting marine life. Snorkelers enjoy the variety of marine life and exciting currents that rush through the crown, creating an exhilarating experience. Highlights include snorkeling with sharks, rays, rock formations, and lots of tropical fish. Black Turtle Cove is situated in the northern part of Santa Cruz. This inlet is surrounded by mangroves and is only accessible by dinghy. The shallow cove is a safe haven for young marine life. Blacktip and whitetip reef sharks, sea turtles, and a variety of rays are often spotted here. Highlights include Hammerhead shark babies, rays, sea turtles, and sea birds.